There's no reason to live with the pain and discomfort of sensitive teeth. 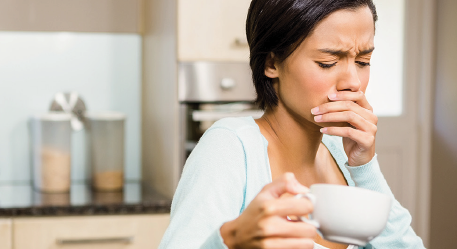 Learn more about tooth sensitivity and what you can do to make it better. Have you ever experienced a sudden sharp tooth pain while having a nice bowl of ice cream on a hot summer day? What about on a cool evening when sipping a cup of hot cocoa? Maybe you've even felt pain from a cold wind against your teeth. If so, you are one of many people who experience tooth sensitivity, also known as dentinal hypersensitivity. It's estimated that tooth sensitivity affects approximately half the population. Tooth sensitivity is tooth discomfort or pain that is triggered by foods and drinks that are hot, cold, sweet, or sour. Breathing in cold air can also be a trigger. The pain affects one or more teeth and is often described as sharp, sudden, and shooting deep into the nerve. This condition often peaks in adults 20 to 30 years old, and then rises again in their 50s. So what can you do about it? It's important to first understand why it happens and what the common triggers are before you can control it. Tooth sensitivity is usually caused by worn tooth enamel or an exposed tooth root. Enamel is the hard layer of the tooth that protects the teeth above the gum line. Under the gum line, cementum protects the tooth root. Underneath these layers is dentin, which is softer and made up of microscopic tubes called dentinal tubules. These tubules run from the center of the tooth to the outside surface. When the dentin is exposed, the tubules allow heat, cold, and acidity to stimulate the nerve inside the tooth and cause the pain associated with sensitive teeth. Visit your dentist. Determining the cause of your sensitivity will help you deal with it. Your dentist can help identify or rule out problems that cause sensitivity pain such as cavities, filling problems, root canals, and grinding habits. Use a desensitizing toothpaste. Using a desensitizing toothpaste can help relieve pain associated with tooth sensitivity. Specific ingredients reduce sensitivity by blocking the sensation from the tooth surface to the nerve. Using it twice a day for at least 4 weeks will help provide relief. Continue to use it for ongoing protection, as well as for other problems you may have such as gingivitis, enamel erosion, and cavities. Use soft-bristled toothbrushes. Tooth sensitivity can be caused by gum recession and enamel abrasion from using hard-bristled toothbrushes, which leave the dentin (a layer of tissue that protects the tooth root) exposed. Using a soft-bristled toothbrush will help you maintain good oral health. You can even use an electric toothbrush with a pressure sensor to help safely guide your brushing habits. Use a daily mouth rinse with fluoride. Daily fluoride rinses are available without a prescription and can help decrease sensitivity and prevent cavities at the same time. Use a fluoride rinse once a day, swishing it around your mouth, then spit it out. Change your diet. Acidic, sweet, and sour foods are associated with tooth sensitivity. Try to avoid or reduce them in your diet as much as possible. Rinse your mouth with water or chew sugarless gum after you eat to reduce the effects of the acid. Maintain good oral hygiene. Brush your teeth twice a day for at least 2 minutes and floss at least once daily to reduce plaque build-up in your mouth. This will help improve your oral health, reduce the effects of acid attacks from plaque and food, and help prevent gingivitis and cavities. Regular visits to your dentist can help you manage your tooth sensitivity. During your check-up, your dentist will document any changes in your mouth and address any dental concerns you may have. Cavities: Cavities happen when tooth decay breaks through the enamel and goes into the dentin layer (a layer of tissue that protects the tooth root) of the tooth. Removing the tooth decay and getting a filling will cover the exposed dentin, strengthening the tooth, and settling any pain and discomfort from sensitivity. Abfractions: Abfractions are notches in your teeth where tooth structure is lost due to aggressive brushing, a very acidic diet, or clenching or grinding your teeth. Placing some bonding in these areas will protect the exposed dentin, strengthening the tooth and reducing tooth sensitivity. Root canals: Problems with tooth sensitivity often occur when the nerve of a tooth root has been damaged. You often experience sensitivity to hot temperatures, foods, or drinks. The process for fixing tooth root problems can range from a simple straightforward procedure to a more complicated one. Speak with your dentist about treatment options before symptoms of sensitivity and pain worsen. Clenching and grinding: The force you exert on your teeth when clenching and grinding causes wear and tear on teeth and removes enamel causing dentin to become exposed. A night mouth guard can be custom made for you to wear while you sleep to protect your teeth. There are many options to relieve pain and discomfort from tooth sensitivity. Consider what's available to you and speak with your dentist today.